In our quest for a tidier landscape, it would seem we have been creating an allergy laden nightmare. Many thanks to Tom Ogren, an agricultural scientist, for pointing out that in plants that have separate sexes, the female is always the one without the pollen. Unfortunately, she also has the flowers that can drop and litter the yard or sidewalk. This has led to the growing trend of planting male only trees in landscapes. But, if you have an allergy or asthma, these male only trees can be hazardous to your health because they produce the pollen. The good news is Mr. Ogren explains how to top graft your trees so you might be able to save them! Mr. Ogren has created an extremely useful tool to rate the allergen causing potential for thousands of trees, shrubs, perennials and herbs. In encyclopedic fashion, he lays out these plants under their scientific name and adds helpful insights about many of them. His allergen rating scale is so thoroughly researched that it has been adopted by the USDA to rank entire cities. There is so much more to this book than a discussion of pollen though. The opening chapters of this book have many useful ideas on how to lead a healthier life and in the process reduce your allergic reactions. For instance, flowers rated on the low pollen side of 2 to 4 in this book, are usually safe to have around, unless you directly inhale their fragrance. 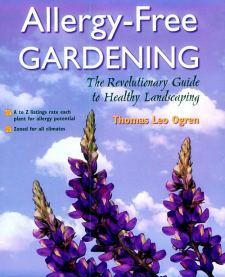 Allergy-Free Gardening is bound to become a most valuable reference for all those who have allergies or who have loved ones that suffer from allergies.